Fig. 1. Dot-plot showing Ramos Cells staining with Annexin V-FITC versus propidium i odide . 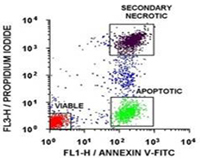 Bio-Rad offers a quick and easy method for detecting apoptotic cells by flow cytometry using the Annexin V Apoptosis Kits. Labeled annexin V, included in the kits, has been conjugated to allow the native phospholipid binding properties of annexin V to remain unaltered. Fig. 2. 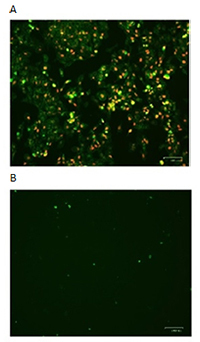 Results using poly caspase FLICA Kits (ICT091 & ICT092) analyzed by fluorescence microscopy show suspension cells labeled with FAM-VAD-FMK, and Hoechst 33342 stain. Both cells are apoptotic and dying - detected by (green) caspase activity and (blue) nuclear Hoechst staining. The left cell is much brighter green than the right cell, indicating that the left cell has more active caspases. Caspases are cysteine proteases that can cleave other proteins, and upon activation, create a positive-feedback cascade, which ensures the cell will undergo apoptosis. Our Caspase FLICA Apoptosis Detection Kits allow analysis of active caspases in whole, live cells. Their methodology is based on a unique cell-permeable and non-cytotoxic reagent called the Fluorochrome Inhibitor of Caspases (FLICA). The reagent contains a caspase inhibitor sequence (such as VAD) linked to a green (carboxyfluorescein, FAM) or red (sulforhodamine, SR) fluorescent probe. Bio-Rad offers four types of Caspase FLICA Kit; FAM FLICA that fluoresces at 525 nm (green), SR FLICA which fluoresces at 590 nm (red), Magic Red FLICA which fluoresces at 628 nm (red) and FLICA 660 which fluoresces at 690 nm (far red). SR FLICA and FLICA 660 are useful for studying caspase activity in GFP-transfected cell lines and for multicolor experiments with other green reagents. Fig. 3. Jurkat cells were stained using the FLISP Serine Protease Assay Kit (APO009) and treated with staurosporine to induce apoptosis. Apoptotic cells positive for serine protease activity can be seen in the bottom right quadrant and dead cells positive for both serine protease and PI in the top right quadrant. Healthy cells are negative for both stains. Data acquired on the ZE5 Cell Analyzer. Serine protease activation plays major roles in apoptosis, tumor malignancy, and as diagnostic indicators of breast, head, and neck carcinomas. They are also thought to play a role in infections and transplant rejection. Our Fluorescent Labeled Inhibitors of Serine Protease (FLISP) Kits allow the detection of intracellular chymotrypsin-like activity of serine proteases in live cells. Active chymotrypsin-like enzymes within the cell bind covalently to the fluorophore (FAM) labeled FLISP inhibitor probe, retaining the green fluorescent signal within the cell. The higher the concentration of active chymotrypsin-like enzymes within the cell, the higher the level of fluorescence observed. 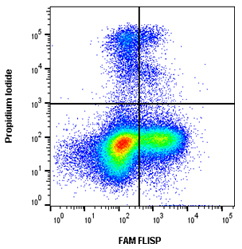 Available in FAM, which fluoresces at 525 nm (green), FLISP Kits also contain propidium iodide for dead cell identification by flow cytometry and Hoechst 33342 for nuclear labeling in fluorescence microscopy. Fig. 4. Jurkat cells stained with MitoPT JC-1 (ICT943 ICT944) and viewed through a fluorescence microscope. Non-apoptotic cells exhibit red stained mitochondria (2 left hand cells). Apoptotic cells at varying stages of mitochondrial membrane permeability appear green (3 right hand cells). The JC-1, TMRE and TMRM MitoPT Kits allow clear differentiation between non-apoptotic and apoptotic cells through the simple and reproducible detection of the mitochondrial membrane permeability transition event. 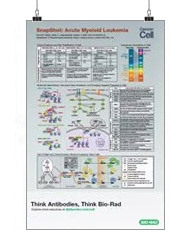 Bio-Rad’s Green and Magic Red Kits for analysis of active cathepsins in whole, live cells, utilize a substrate based assay. These kits enable the detection of active cathepsins contained in lysosomes, which are involved in the autophagy pathway and phagocytosis. When released into the cytoplasm, they can regulate both the apoptosis extrinsic and intrinsic pathways. Fig. 5. Cathepsin B staining in HeLa cells. 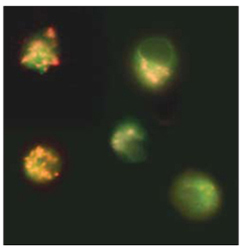 HeLa cells were stained with Magic Red Cathepsin B Kit (ICT937) using Hoechst as a counterstain. A, Hoechst. B, Magic Red Cathepsin B. C, overlay. Fig. 6. HeLa cells were incubated A) in the presence or B) in the absence of staurosporine to induce apoptosis. pSIVA-IANBD and PI were added to the media and the cells imaged with the ZOE Fluorescent Cell Imager. Early apoptotic cells are pSIVA-IANBD positive, shown in green, while late apoptotic cells are PI positive, shown in red. Visualize apoptosis events in real time with our pSIVA Real-Time Apoptosis Fluorescent Microscopy and Flow Cytometry Kits. pSIVA only fluoresces when bound to phosphatidylserine (PS), which becomes exposed at the outer plasma membrane as one of the early events of apoptosis. The pSIVA probe is conjugated to IANBD, a green emitting dye with spectral properties similar to FITC. No washing steps are required; simply add the probe to your cells and start visualizing apoptosis in real time. 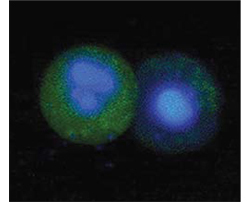 The pSIVA Real-Time Apoptosis Fluorescent Microscopy and Flow Cytometry Kits also contain the viability dye propidium iodide, allowing you to distinguish early apoptotic from late apoptotic and necrotic cells.